Combine Advisors around the Borealis in the third Episode Three concept art image, created in 2007 and released in 2008. Since the release of Half-Life 2: Episode Two within the The Orange Box on October 9, 2007, little news regarding the fate of the subsequent third and concluding chapter in the episodic trilogy has been revealed. The following is a timeline of known information pertaining to the future of the Half-Life franchise. On June 28, 1999, the domain half-life3.com is registered under the same details as half-life2.com with Valve cited as the contact. The URL simply redirected to the Orange Box website for several years until the domain lapsed in early 2014. In May, Episode Three is announced for a tentative Christmas 2007 release. The same month, it is revealed that a new episode will be released every six to eight months and will take four to six hours to complete. Two teams inside Valve will develop the series: the first team will work on Episode One, and once it has finished work on the game, it will move to develop Episode Three. The second will develop Episode Two concurrently to both projects. An Episode Four, developed outside of Valve and with a stand-alone plot, is also mentioned. 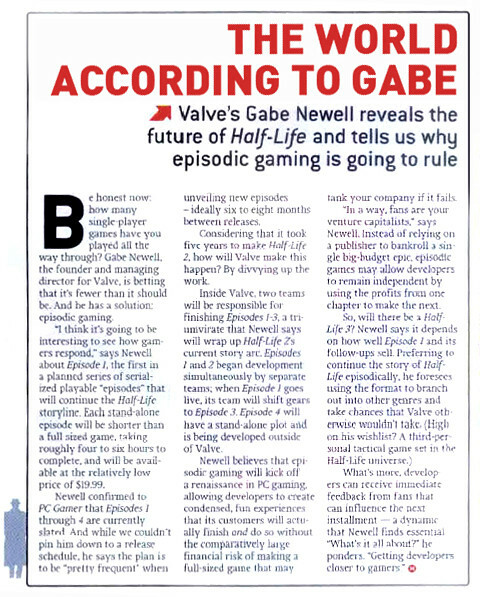 In June, Gabe Newell refers to the three Half-Life 2 episodes as Half-Life 3. Episode Two is announced for Q4 2006 and Three for 2007. Newell states that all the episodes are "worked out" and that each release will move farther beyond the Eastern European and City 17 sensibilities. He also states that the G-Man plays a pivotal role in the episodes: what happens when he loses control of Gordon Freeman, when Gordon is not available to him as a tool, how he responds to that, and what the consequences of that are. Gordon is also confirmed to be the main protagonist of all three episodes. Newell adds that expansions similar to that of Half-Life may also be made at some point. Combine Advisors following a humanoid figure into the Borealis in the first Episode Three concept art image. In a May interview given by David Speyrer and Doug Lombardi about the development of Episode Three, it is stated that a lot of work has gone into creating a natural progress of topography and climate between Two and Three, and that the player will not head back to City 17, at least not in this game. Furthermore, Speyrer does not want to comment about speculation started by PC Gamer UK on the game's climax being a battle set at an Arctic research station. In October, Episode Two is released. At the conclusion of the game, Gordon Freeman and Alyx Vance are about to leave to Arctic locations in search of Judith Mossman and the newly recovered Borealis, the Aperture Science icebreaker. In a November interview, David Speyrer explains that an Episode Three teaser at the end of Episode Two was deliberately omitted to avoid ruining the mood of the final scene by having it followed with a high action trailer. Another reason was to give them more creative freedom and avoid being committed to anything seen in the potential trailer, stating they are trying to do "something pretty ambitious". He also states they did not want to make the same mistake as with the Episode Two trailer featured at the end of Episode One, as it was radically different from the finished game. In November as well, the first concept art for Episode Three is released by GamesRadar. In December, Episode Three is said to be the end of only the current Half-Life 2 story arc, not the end of the overall Half-Life series. Gordon Freeman face to face with an Advisor in the second Episode Three concept art image. In early 2008, Valve artist Andrea Wicklund uploads 33 pieces of concept art she made for Episode Three on her Picasa account. They would only be discovered by the community over four years later in June of 2012. In April, source code for three entities is released in the Source SDK in a folder named Episode3 shortly before being removed thereafter. They include npc_combine_armored (a heavily armored Combine soldier with separate shields for each part of his body), npc_wpnscanner (a scanner shooting bolts), and weapon_proto1 (appearing in the Source Particle Benchmark and Episode Two as a test weapon). However, it is later stated by Valve's Tony Sergi that the code is a leftover from old material. In July, the second piece of Episode Three concept art is released through the winner list of the Into the Pixel contest of that year, depicting Gordon Freeman with a crowbar face-to-face with a Combine Advisor. This artwork was illustrated by Valve artists Ted Backman, Jeremy Bennett, and Tristan Reidford. The same month, a third piece of concept art is revealed by GamesRadar, although it was created in 2007. In an October interview, Doug Lombardi states that news or an announcement of Episode Three might be revealed near the end of the year. In that interview, Lombardi also states that the distance between Episode Two and its sequel will be longer than the distance between the three current Half-Life 2 games. In an August video involving Gabe Newell and two interpreters discussing deafness and video games with a small audience of hearing-impaired people, the inclusion of an unidentified deaf character in a future game set in the Half-Life and Portal universe is said to be tested by Valve as a new gameplay and Source engine feature aimed at providing better support for hearing-impaired players. Newell suggests that before Alyx met Gordon, she had a crush on a hearing-impaired Resistance member, so she programmed Dog with knowledge of sign language so she could practice and easily communicate with him. Then this person went elsewhere to fight the Combine, but Alyx and Dog continued signing with each other when they wanted to communicate without making noise or without other people knowing. The same month, Newell explains in an interview that Valve is experimenting with many techniques on their games, including Episode Three. He adds he has currently nothing to say about the game, and that the community will be notified as soon as they have material they are ready to share. List of the hint nodes found in the Alien Swarm SDK. In a March interview, Newell hints that Valve intends to return the Half-Life franchise to its psychological horror roots by exploiting the fans' deepest fears, which he sums up as "the death of their children" and "the fading of their own abilities". In an April interview, Gabe Newell states that Gordon Freeman will be unchanged in the next Half-Life game. He wants him to "largely remain an arm and a crowbar." There also are no plans to make him a talking character, as Newell considers making the player's companions more interesting and compelling seems a more fruitful avenue to explore. Shortly after Alien Swarm is released in July, unused hint nodes are found in its SDK with the prefix "Ep3" and one mention of "Aperture". These hint nodes are Ep3 Blob Shake Position, Ep3 Fire Cover Position, Ep3 Brain Cover Position, Ep3 Brain Regenerate Position, Ep3 Spit Position, Ep3 Spawn Generator Position, and Aperture: Nest. In an August interview, Doug Lombardi states they hate to make the community wait but have no announcements regarding Gordon Freeman or his ongoing adventures at that time. The two Half-Life fans picketing outside of Valve met by Gabe Newell in August 2011. The Half-Life 3 T-shirt as photographed on December 1, 2011. In February, Chet Faliszek states that Valve is "not prepared to talk about [Episode Three] at the moment". When asked about the future of the Half-Life series in a March interview, Doug Lombardi states that they are not done with Gordon Freeman's adventures and advises the community to "hang in there" with them without further detail. On April 19, Portal 2 is released. The same day, The Final Hours of Portal 2 is released. In it, author Geoff Keighley states that Portal 2 is probably Valve's last game with an isolated single-player experience. This is construed by many members of the community to mean the end of singleplayer games made by Valve. Gabe Newell refutes this idea in a May interview, stating that Valve is not done with singleplayer games, but rather wants to transform them into "single-player plus" games, thus singleplayer games with social components added to them. He remarks that entertainment is inherently increased in value by having it be social, letting people play with their friends and recognizing that they are connected with other people, a concept they wish to add to their singleplayer titles. In another May interview, Newell states that Valve is done with the episodic model as we know it, now rather updating the same game as much as they want through Steam, an approach they were now taking with Team Fortress 2. The same month, the Portal 2 SDK is released. In the files, code for an NPC named Combine Advisor - Roaming is found by users. It is quickly removed in a subsequent update. In May again, several .vcd choreography files labeled "magnuss" are found in Portal 2's VPK cache. They are named magnuss_get_going.vcd, magnuss_idle.vcd, magnuss_nopoint.vcd, magnuss_shakehead.vcd, and magnuss_wave.vcd, and appear to be for the model magnusson.mdl, Dr. Magnusson's model. They don't exist in the Episode Two files, where Magnusson's animations are prefixed "mag", suggesting they may be either old discarded animations or from a different project altogether. In June at the Games for Change festival in New York, Gabe Newell delivers a keynote focusing largely on the educational benefits of games. When Newell asks the audience for any questions, someone asks when Episode Three is going to be released. Newell's answers "If you know enough to ask the question, you know enough what the answer is." On August 11 and 12, three fans picket outside of the Valve headquarters in Bellevue, Washington, requesting information about Episode Three / Half-Life 3. Gabe Newell comes out to speak with them in person. However, upon being asked when a new Half-Life was coming out, Newell merely answered "I can't tell you.". Following the "protest", Kotaku also asked Newell if he had anything to say about a new game, to which he simply replied "I got nothing for you.". Around September 19, a Vietnamese beta tester leaks Dota 2’s entire game client, as well as all of its files, to the Internet. Among the various files can be found code referring to a folder named "ep3", pointing at what appears to be weapons: weapon_icegun, weaponizer_concrete, weaponizer_liquid, weaponizer_metal, and weapon_flamethrower. However, on September 23, Chet Faliszek states that the code doesn't mean anything and shouldn't be taken as fact. December 2011 sees several rumors about a Half-Life ARG, and that Gabe Newell has given the go-ahead to those in the know to drop Half-Life hints. Fans see what may be hints in Wheatley's "Character of the Year" award acceptance video for the Spike TV 2011 Video Game Awards, several fake official e-mails are shared, cryptic information is revealed through an unofficial Twitter account for Doug Rattmann, and an unofficial website, Black-Aperture.com, reveals other cryptic messages. All is debunked by Valve through Gabe Newell, Marc Laidlaw and Chet Faliszek. On December 1, Chandana Ekanayake, part of Seattle-based game developer Uber Entertainment, sees what he believes to be a Valve employee wearing what appears to be a Half-Life 3 T-shirt at a local developer event and asks his permission to take a photo of the T-shirt as he is a huge fan of the series. Upon being asked if he knows anything about Half-Life 3, he appears to know nothing. On December 1, a fan asks series' writer Marc Laidlaw about the validity of the T-shirt. Laidlaw confirms its existence but has nothing else to elaborate on. On December 9, an anonymous US-based voice actor reveals that Valve has recorded lines for "Half Life: Episode 3" (sic). This leads to rumors that the next Half-Life game will be unveiled at the 2011 Spike Video Game Awards on December 10. However, this doesn't occur. On December 23, voice actor John Patrick Lowrie debunks on his personal blog the words of the anonymous voice actor from December 9. He states in the comments on a post about his wife Ellen McLain being nominated for a VGA award that he hasn't heard anything yet about a new Half-Life game and thus has not recorded anything yet. He states, among other things: "No Half Life 3 stuff yet. Haven’t heard anything." and "Ellen and I haven’t heard anything about a new Half Life episode." Advisor cornering an individual in Xen. On January 13, Marc Laidlaw confirms the rumor that a fourth and canceled Half-Life 2 episode, Return to Ravenholm, was being developed by Arkane Studios from 2006 to 2009. On February 19, Gabe Newell states in an interview that Valve is aware of how much they annoy the fanbase with their lack of communication about the future of their several series and that it is frustrating to them to put the fanbase in that situation. He adds they don't want to happen again what happened for Half-Life 2, i.e. delaying the game after promoting it and giving a precise release date, to avoid exciting gamers then disappointing them. He concludes that they now prefer to be sure of themselves before officially announcing anything. On April 23, as part of an online audio interview, Gabe Newell discusses Valve's total silence concerning the next Half-Life game yet again, this time using the codeword "Ricochet 2" to talk about it more covertly. He states that the game's development has undergone many changes, twists and turns since it first began and thus it is fairer and more reasonable to the fanbase to maintain radio silence rather than having to put them through the many changes, transformations, twists and turns as well. As stated in earlier interviews, they prefer to wait so that they can be as sure as possible about how the project will manifest before making any formal announcement or reveal. In their story on the subject, Develop Magazine reveals that in 2011, they were "reliably informed that 'unexpected concept changes' were central to the delay to the Half-Life 3 project". On June 27, 33 pieces of concept art for Episode Three uploaded by Andrea Wicklund on her Picasa account in 2008 are discovered by the community. The images depict an Arctic setting and include several redesigned outfit variants for Alyx Vance (two depicting her wearing her father's jacket, one her father's Harvard sweater), several outfit variants of additional unknown characters wearing fur hooded winter coats most of the time, several renditions of the Mil Mi-8 crashed into the ice, and several images of a reimagined Xen (clearly identified as "ep3_xen#.jpg" by Wicklund herself), including an unknown entity, redesigned islands, an individual with a fur hooded winter coat, and a Combine Advisor cornering a similar individual. The next day, Wicklund's portfolio was deleted. On June 18, several internal Valve projects are discovered from a mailing list found within the company's project management and bug tracking software, JIRA. This list includes mentions of Half-Life 3, Left 4 Dead 3, and Source 2. The Half-Life 3 mailing group contains 42 employees, which is known to have been updated fairly recently as it includes Paul Pepera who had only joined Valve in March of the same year. However, it is noted that only one group pertained to Half-Life 3 while the similarly unannounced Left 4 Dead 3 already had multiple groups dedicated to it, indicating it was at a more active development stage than the former. On August 13 and 14, John Patrick Lowrie remarks on his blog that he has had a recent conversation with some Valve employees who told him that implementing motion capture animation in an interactive manner is "the biggest challenge with bringing out HL3." He also states that, as far as he knows, "HL3 is not being worked on at this time" for additional unspecified reasons. These comments were soon deleted in the following days, and Lowrie posted an explanation claiming that he "misspoke" earlier and stated that, as a voice actor, he would only be informed of a game's status after being hired late into its development cycle. On October 1, Valve's JIRA database became publicly viewable for a short time again. It is noted that some employees have been added to the previously known Half-Life 3 group, now coming to a total of 46 people, while a new group known as Half-Life 3 Core has since been created containing a smaller subset of the former group, including former Valve designer Kelly Bailey and Adam Foster, among others. On May 15, Minh Le, a former Valve employee and the co-creator of Counter-Strike, states during an interview with goRGNtv that he "did see something that looked kinda like in the Half-Life universe" and "it wouldn't surprise anyone" if he said "they're working on it." He also stated that he "did see some concept art for Half-Life 3," although he did not specify as to when this occurred. On February 10, a single reference to "hl3" is reported to be found within the Dota 2 Workshop Tools. Inside the file model_editor.dll, the command line parameter physics_testbed.exe -game hl3 -open is present. However, it is not known how old this piece of code is. On October 9, a day before the eighth anniversary of The Orange Box's release in 2007, Valve released, possibly unintentionally, four help files used by the Source 2 version of Hammer, the level editor. These files instruct the level designers on how to use the entities defined in the "Game Definition Files". In Source, these game definitions are stored as .fgd files. hl3.txt and ai_basenpc.txt appear to contain information related to Half-Life. The other help files were lights.txt, a file that explains how light characteristics work in Source 2 and rpg.txt, a base for a role-playing game prototype. rpg.txt is known to be an unrelated and independent project since it has its own map properties. A vast portion of the hl3.txt file consists of Half-Life 2 code ported over to Source 2 with some changes and additions. It includes the Base AI functions (such as companions, squad following, scripted sequences) from Half-Life 2, a possible quest system, virtual reality settings in the map properties (enable VR Chaperone, VR Movement), and many other features. The listed entities include npc_quest_citizen, npc_hunter_invincible, npc_turret_ceiling_pulse (Combine Pulse Ceiling Turret, a new enemy), and props_zipline, item_generic. A possible Left 4 Dead-style AI Director for procedurally generated enemy placements, similar to the version used in Left 4 Dead 2. The level designers have more control over the spawns. There are hints of a possible game mode with multiple players referenced in the attributes of item_generic. These include: Associated PlayerCounter Name (HL3 only)[i], Pickup prevents respawning (HL3 only)[i]. On January 17, Gabe Newell conducted an AMA session on Reddit. While he explicitly stated that he had no information to offer in regards to what Valve plans to do in the future with the series, he stated that, due to his greater involvement in the decision making in the games, he personally looks at Half-Life as a series of things he regrets. He also stated that it would be possible for a new IP that takes place in the Half-Life and Portal universe. On July 17, an interview with now-former series writer Marc Laidlaw, who had retired from Valve the previous year, is released on Arcade Attack. In response to a question about Half-Life 3 which inquired as to whether it would ever be released, Laidlaw stated he didn't know. He remarked that he had ideas for Episode Three that would have allowed him to tie up the loose ends to a personal satisfactory degree, resolving the plot threads relevant to Half-Life 2, and be able step away from the series so as to give freedom to the next individuals who would inherit the storyline. Unfortunately, he was not able to achieve that. He considered Episode Three and Half-Life 3 to be separate entities, adding that he had not thought as far ahead as to what would constitute Half-Life 3. However, he hoped that there would be a dramatic shift between HL2 and HL3 just as there was between HL1 and HL2, intending for Ep3 to end on another cliffhanger with Gordon yet again being put into indeterminate stasis until the next title. Also asked if would be willing to work on the in-development Half-Life title, Laidlaw stated that he had no interest in going back. On August 24, Laidlaw released a short story on his website entitled "Epistle 3" which garnered great attention from the community. Presented as a letter, the writer gives an account of what appears to be a summary of the storyline following Episode Two written with numerous code names in place of the actual Half-Life 2 series characters and elements. The writer, implied to be Gordon Freeman himself, addresses the "Playa" asking for forgiveness for being silent for so long and going on to explain his circumstances since "Epistle 2". Substituting in the most likely equivalent names, the letter tells how, following the burial of Eli Vance, Gordon and Alyx would travel by helicopter to the coordinates in the Arctic regions provided by Dr. Mossman hoping to find the lost research vessel Borealis and carry out Eli's wish of destroying it before it could be captured and utilized by the Combine. After their aircraft is shot down (an event seemingly depicted in earlier concept art), they discover a large Combine fortification in the ice. They also witness a mysterious hallucination quickly phasing in and out of existence which they eventually realize is the Borealis itself. After confronting Dr. Breen in the form of an Advisor, the two find Dr. Mossman being held in an interrogation cell. While Alyx is still distrustful of her, Mossman helps them board the ship during one of its brief moments of existence. Aboard the vessel, they attempt to control and harness its power: the ability to teleport anywhere instantaneously. The previous Aperture Science personnel had activated the ship's Bootstrap Device to prevent it from falling into the hands of the invading Combine forces years before, causing it to continuously travel back and forth through both time and space. Believing that the Borealis could be saved and studied by resistance forces, Mossman argued with Alyx who still wished to destroy it per her father's wish, concocting a plan to set the ship to self-destruct and ride it into the heart of the Combine's invasion nexus. Before Mossman can shut off the Bootstrap Device, Alyx shoots and kills her. With the Borealis armed and heading towards the Combine's command center, Alyx and Gordon prepared for their demise when The G-Man suddenly entered, safely removing her from the situation. Gordon now alone and only moments away from destruction, the Vortigaunts would similarly intervene and retrieve him as well, bringing a close to the events of the series. The letter ends with the writer marking this is his final "epistle". Laidlaw later referred to the story as a "fanfic" and a "snapshot of a dream [he] had many years ago." A version of the letter with the correct names is viewable here. Combine Advisors following a humanoid figure into the Borealis. Combine Advisors around the Borealis. Gordon Freeman face-to-face with an Advisor. Bust of Alyx wearing a reused Soviet army officer ushanka, with "hammer and sickle" cap badge. Bust of Alyx with her ears protected. Full-size Alyx in a weapon holding position. Full-size Alyx with goggles and jacket. Full-size Alyx with goggles and vest. Full-size Alyx, with a "pirate"-ish style. Full-size Alyx wearing her father's jacket and a sweater similar to that of Mossman. Unknown character with goggles and ice axe. The crashed Mil Mi-8 with unidentified structures in the background. Ditto, with a large installation in the background. Ditto, with two figures overlooking the horizon. Unknown entity in Xen with a figure trapped in a bubble of some sort. ↑ Steamcast Episode #9: "Exclusive interview with Gabe Newell"
This page was last modified on 12 January 2019, at 19:29.